NaH is a grunge-rock power-trio from Little Falls, NJ with a jagged, bluesy sound, and a fascination with tragedy, rock n' roll, and obscure presidents. NaH was formed at the beginning of 2010 by Ben Shooter and RJ Challice, who shared a love of bands like Black Sabbath and Iron Maiden and were inspired to make music themselves. Initially, they had difficulty finding a drummer, but when Zach Thomas agreed to learn drums and complete the power-trio, their problem was solved. NaH started out playing covers by groups like the White Stripes and the Rolling Stones, and playing smaller events like school talent shows and coffee houses. It seemed that many people underestimated how much the band would grow. NaH began to write original material. With lyrical input from all three members and Ben's riffs, the band wrote their first five songs - "One Hour Calls", "Girls From Mars", "Live Evil", "The Best of You", and "Happy For Once". These songs made their debuts at the venues NaH played at. Many a show was opened with the frantic "Girls From Mars" and closed with the bluesy sigh of "Happy For Once". NaH searched for opportunities to record their material, and began a four-song demo that ultimately did not pan out. However, the band kept performing and kept writing. They derived inspiration from both unusual things and aspects of life. These inspirations spawned "Zachary Taylor", a song about an obscure president, and "Sucker for Tragedy", a song inspired by heartbreak and confusion. On the last day of the year 2012, NaH was finally able to record at Supreme Sound Studios in Woodland Park, NJ. 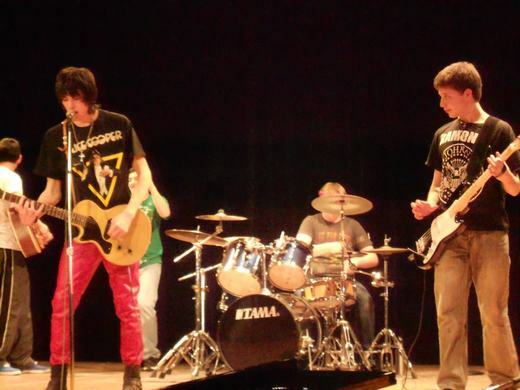 With the help of Brian Csencsits, they recorded their first single, "Sucker for Tragedy"/"Zachary Taylor", and released it on iTunes soon after. The single was a turning point in NaH's career, and seemed to mark their inception as a serious band. It was featured on Sleaze Roxx and Two Guys Metal Reviews, and gained fans in NaH's hometown. NaH is currently trying to promote its single and find more gigs to enlarge its fanbase and fund future recordings. NaH has played at a wide range of venues and events- including and not limited to talent shows, The Fine Grind (Little Falls), The First Reformed Church of Little Falls, Insanitea (Montclair), Waynestock (Wayne), the Canvas Clash (Boonton), the Little Falls Morris Canal Fair, and Cops and Rockers (Verona).